Yesterday was a very good day for SpaceX. Artist's impression of NASA's DART spacecraft slamming into an asteroid. Yesterday (April 10) was a very good day for SpaceX. The company's Falcon Heavy rocket aced its first-ever commercial mission, lofting the huge Arabsat-6A communications satellite and sticking three first-stage booster landings, one of them on a ship at sea. And at about the same time this spaceflight action was going down, NASA announced that SpaceX will fly its Double Asteroid Redirection Test (DART) planetary-defense mission. The total launch cost for NASA will be about $69 million, agency officials said. If all goes according to plan, DART will launch aboard a Falcon 9 rocket from Vandenberg Air Force Base in California in June 2021. 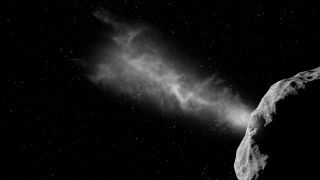 In October 2022, the spacecraft will slam into "Didymoon," the 540-foot-wide (165 meters) satellite of the near-Earth asteroid Didymos. Telescopes here on Earth will document how the collision affects Didymoon and its orbit around the 2,540-foot-wide (775 m) Didymos. Such observations will help researchers assess the "kinetic impactor" strategy of dangerous-asteroid deflection, DART team members have said. And we may get some up-close looks at the battered Didymoon as well. A candidate European mission called Hera would launch toward the Didymos system in 2023 and get there in 2026. It would inspect the fresh crater and make detailed measurements of Didymoon's altered orbit, with the aid of two briefcase-size cubesats. It's still unclear if Hera will ever get off the ground, however. The European Space Agency is expected to decide the proposed mission's fate by the end of the year. DART won't be the first spacecraft to wallop an asteroid. Earlier this month, Japan's Hayabusa2 probe smashed a copper cannonball into the space rock Ryugu, to unearth pristine subsurface material for study. Hayabusa2 may also collect some of this newly unearthed stuff, mission team members have said. Hayabusa2 is a sample-return mission. The probe has already snagged one Ryugu sample, which is scheduled to come down to Earth in December 2020.